You know the drill - content is and always will be king. Everything you deliver to your audience counts as content marketing, including everything you do online and print. But content is only going to be effective if it’s valuable, tailored to your target audience, and distributed correctly. In this article, I’m going to walk you through why your content marketing and social media are so important. We’re going to talk through why they should work in sync together and how you can make sure that happens. First off all though, let’s clear up a few things. Content marketing is this buzz word that’s thrown round the industry and I know it sometimes confuses you. Essentially, it’s delivering content to your audience that is spoken in your message and packed with value. The expensive way is creating vouchers, giving away prizes or organising events. But these things cost money and drain out not only your money, but your time too. The cheap way (and sometimes the free way) is to create content. If you create content that your audience finds valuable, it will add value to every aspect of your online presence. Plus, you only need yourself, a laptop, and your message. For some more ideas, Sumo has created a list of 28 different types of content upgrades or resources you can create. Check them out here to get some ideas! WHAT ABOUT SOCIAL MEDIA CONTENT? Social media plays a key role in your content marketing strategy. Everything you post on your social media channels directly relates back to the content on your blog. And the great thing is, you can use social media strategies alongside content marketing strategies, as well as creating strategies specifically designed for each social media channel. 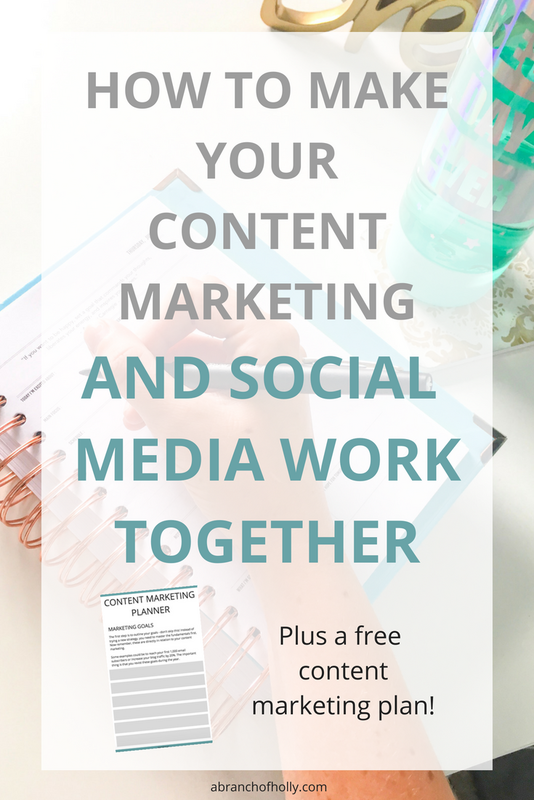 Using your content and social media together is going to be the most effective. It’s important to remember that having a social media presence is essential for your brand. Take it back a good few years ago. Promoting yourself online used to cost a lot more than it does now. I mean, you need to build a brand, create awareness, and get yourself known. What can make that happen? Content marketing. It helps you build your brand awareness and build your reputation as an influencer. Want to create your own marketing plan? Download the free workbook to accompany this blog post! Look at what your competitors are writing about. Now I’m not say copy. But you can take some popular ideas, give them your own personal twist AND make them better. Look at what your readers search for. You can get this information from social media platforms, Facebook groups, YouTube search, or when they email and ask you questions. Once you’ve done those two exercises you can create a plan. Now your content marketing strategy will be aligned with exactly what your audience wants to read. You want to be known for something specific in your industry whether it’s a topic or a message. And that will happen if your content is good enough. WHY DO WE NEED CONTENT MARKETING IN THE FIRST PLACE? Think about it. If you consistently share your content with your audience, you’re not just sharing. You’re communicating. You’re building trust between your brand and your audience. This is where social media really comes into play, because it facilitates communication and the distribution of your content. You won’t grow your audience overnight. But the better your content is, the more people you’ll attract to your blog. People are always searching for information. If you give the right people the right information then you’re going to attract more readers, whether through social media, organic search or word of mouth. This is so important to remember! People will only take advice if they know it’s coming from a reputable source. If you can demonstrate that you can be trusted, whether that’s through your knowledge or experience, that’s how you build yourself as an influencer. People will constantly come to read your content AND they’ll share it with the people they know. That’s where the magic happens. If you’re launching something new, you need to promote it, right? You definitely want to make your audience aware, not just what you’re launching but how it will benefit them. Through content marketing, you can help make this possible and easily shareable too. This is the part where social media is truly effective. Engagement is so important to your brand in terms of various things, including answering questions, and delivering fresh information. Everything you do online makes you more visible. And what you write about will directly help you build your brand awareness. The way this works is that by publishing valuable content, you’ll attract more readers to your blog. Those readers will then associate the information you give them with your brand. That makes you valuable and will encourage people to trust you. I mentioned this in a recent video on myths about growing your audience (you can watch it here) - but you don’t have to be on every social platform. It totally depends on where your audience hangs out. Let me just clarify - organic search is still a really great way to attract more readers. You should be focusing on that be creating great titles for your blog posts and including keywords in your content. But people spend A LOT of time on social media. Because of this, your content is likely to reach a higher audience. If one person retweets a piece of your content, that’s a whole new group of people who could become fans of your brand. Have you heard of Rebekah Radice? I hope so. She is a digital marketing and social media knowledge guru. And she demonstrates that through all her social media channels, but most specifically Twitter. Which one will you use to inspire your audience? Every single tweet that Rebekah posts is engaging in the way she creates her messages. Whether it’s giving us a motivational message, teaching us a tip or sharing her latest blog post, you can tell she puts a lot of effort into crafting each tweet. And it works - she’s got 113k Twitter followers. We live in a noisy world. There’s a lot of content and information everywhere you look, which means our attention span is lower than ever. On social media especially, you have a few seconds to capture your audience. Most of the time they’ll skip past it. But if you grab their attention as soon as possible, you gain more time with them too. The way Rebekah’s tweets are crafted is different and that will engage people. They’ll read her content and make even like, retweet or click through to read more. Content is only as valuable as the information that it contains and that is based on the audience. A good blog post should be informative and answer questions. But you know what’s even better than that? Take Amy Landino. She spends so much time creating videos based on what people ask her. 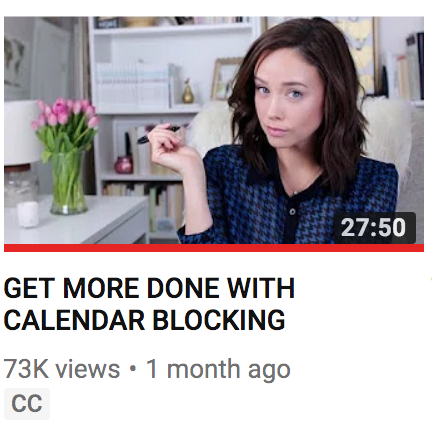 In one recent video she mentioned calendar blocking and asked if her audience wanted a full video on this. They said yes, so she created one. This is a great example when it comes to content marketing because this video answers one question in particular. While in the past blog posts have been the be-all and end-all, it’s now video content that’s taking over. Bloggers are now turning to YouTube to consume a lot of their content. So it’s no surprise that video is a great piece of content to use in your marketing plan. This is why I picked this example! Again, this just goes to show, because at the time of writing this, she’s got over 200,000 subscribers. Ah headlines, we couldn’t forget you. This example comes from the CoSchedule blog, because they are pros when it comes to knowing how headlines work. 80% of people will read your headline but only 20% will go on to read the rest of your content. The way you craft your headline is crucial. The two most important distribution factors for your content are social media and organic search. If your article is valuable enough, it will continue to be shared to potentially millions of people who could become fans of your brand. But in order for this to happen you need great headlines. You want them to be shareable and create intrigue for your audience, without giving too much away. Did you know that users are 28% more likely to engage with your brand if they see you sharing user-generated content? So how do you do it? Carly Rowena incorporates it into her strategy really seamlessly. She’s created an eBook that she sells to her followers called the Get Gorgeous Transformation Guide. People who use the guide always tag Carly in their Instagram Story snaps and Carly shares them on her own Story, as they use the hashtag #getgorgeousguide. We’ve said it all along but if your content is of a high quality then people will naturally want to share it. Choose the right social media channels for promotion and distribution. In this example it was Instagram, but you can choose the platform that works for you. Encourage people to share their content to that platform using a hashtag you’ve created. Content marketing is so important for growing your online presence because it means you’re always adding value. And you need to make sure that valuable content reaches your target audience through social media and organic search. Social media can really help to expand the reach of your message, which is why it’s important that it works alongside content marketing. Now you’ve seen a few examples of how it can be successful you can take these and work them into your own brand. How do you feel about social media and content marketing? Do you think they should work together? Let me know your thoughts in the comments. P.S. Don't forget to download your very own content marketing workbook to help plan your own strategy!